(1)Go to B1 floor in Terminal 1. (2)Go to 1F in Terminal 2. Arriving 「Taipei Main Station」 or 「Taoyuan Train Station」, visitors can buy tickets to 「Ruifang Train Station」. Please turn left after going out of Ruifang Train Station and walk to the bus office in front of Ruifang police station for taking buses. It take about 15 minutes for buses heading to the terminal from the bus stop. Please get off the bus at Jiufen Old Street Stop, where is also the destination for most passengers. In Taipei downtown, you can take MRT (Mass Rapid Transit) BanNan line(the blue line)and get off at "Zhongxiao Fuxing Station" then go out from the 1st exit to transfer the "Taipei-Jinguashi" bus. Please also get off at the same stop "Jiufen Old Street Stop". 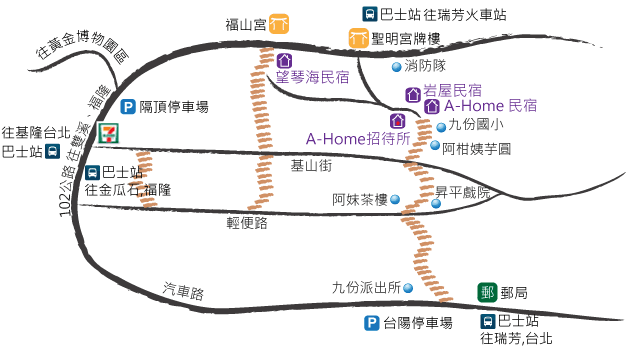 After arriving at the station, walk into Jiufen old street to No.155 Jishan Street, and take the stairs on the left. The end of the stairs is the "Jiufen Elementary School", please go up along the stairs on the left. A-HOME is at first left turn. The end of the stairs is the "Jiufen Elementary School", please go up along the stairs on the left. A-HOME is at first left turn.